I an Brennan has worked to bring music diversity to the ears of listeners around the globe since he began making field recordings in San Francisco in the early 1990s. His first journey to another culture was with his wife, documentarian Marilena Delli, when they went to Rwanda. Delli’s mother was visiting her native land for the first time since the genocide of 1994, and Brennan’s wife was making a documentary about her return. The duo also wanted to actively search for music while they were there. Brennan said they were fortunate to meet The Good Ones, a trio of Rwandan genocide survivors who play joyous, acoustic love songs written in the ancient local street dialect. He recorded with them and helped create their first album. Brennan said he and his wife rather liked searching through hundreds of thousands of miles of African savannah and desert to have the chance to work with the outstanding musicians that they found – even if that meant listening to as much, or more, bad music than good along the way. Tinariwen, a band whose tribe is in Mali, North Africa, recorded the album “Tassili” with Brennan and his portable studio. The album won a Grammy for Best World Music Album in 2012. Another group, the Malawi Mouse Boys, named for their side job of selling grilled mice kebabs on the side of the road, were introduced to the global music scene by Brennan and Delli. They released their third album “Forever is 4 You” on April 8. 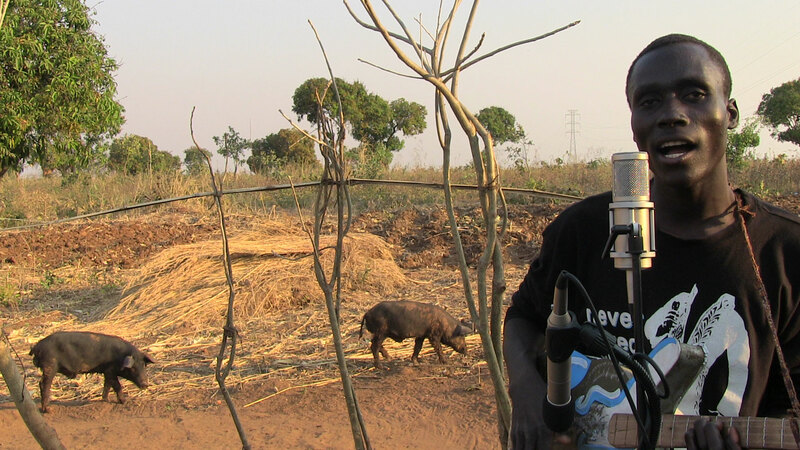 Alfred, of the Malawi Mouse Boys, is one of numerous musicians in Malawi whom Ian Brennan has recorded for a world audience. And then there is The Zomba Prison Project, with 60 collaborators – all incarcerated in a maximum security prison in the southern Malawi city of Zomba. The album, “I Have No Everything Here,” received Malawi’s first-ever Grammy nomination in the World Music category. Suzanne Zalokar: When you say, “One of the only guitar bands in the last 25 years worth listening to,” do you mean of all guitar bands ever – this guitar band from Malawi, one of the poorest nations in the world, is the guitar band to listen to? Ian Brennan: Guitar is an extremely overplayed instrument. It has pretty much been exhausted of its possibilities. The hype that surrounds English-speaking, two guitar, bass, drums combos is pretty tiring. There have only been a handful of bands that have done anything very interesting and of those, Tinariwen, because they bring such a different perspective on time – the way they structure rhythms, and the way they play together as a unit, often three or four guitar players at a time. S.Z. : What do you think of the label, “world music” or “indie” rock? I.B. : Those are ways of selling music for the most part. I think world music is especially problematic because it dictates something as the center and everything else is “other,” and I think that is a very dangerous concept. Cultures that are so very different from one another get clumped together as one category whereas, what’s the difference between heavy metal, rock, hard rock, alternative? Those lines are nearly indistinguishable sometimes. Yet, in world music you are talking about everything from Inuit music to spiritual music from Pakistan to somebody who is playing a 20-piece symphonic beat music from Ethiopia. It’s sort of ridiculous putting them all together. Everybody wants to be an outsider, but it is usually extremely hollow. It’s not real at all. As a genre, indie rock has become just as predictable as any other genre that they are supposedly rebelling against or offering an alternative to. For people in America or in the U.K., when they have nothing else to call something, they want to call it “blues,” and because so much American music originates from the American Blues, a lot of times people will overly prescribe that to being influential in places it simply is not. I mean, there is blues music in Cambodia and there is blues music in India and in Africa and they were not influenced by American Blues. Maybe in some recent fashion, but most of these forms have been around for hundreds of years or longer, and they are completely independent of the American Blues. S.Z. : You have a new book: “How Music Dies or Lives: Field recording and the battle for democracy in the arts.” Can you speak to the damages of colonization in generalizing distinctive variations? I.B. : We live in a time where people potentially have the opportunity to hear more voices than ever before, but in fact, they listen to fewer. Certain voices dominate. Stylistically there is a real repetition, which is the nature of recorded music. It’s the ability to repeat and copy without error, exactly what has come before. There are dangers in that. There is beauty in it too, there are strengths in it, but there are dangers. The book is about bringing up points for people to reflect on and have a dialogue about. What is focused on (in mainstream Western music) are the superficial aspects of personalities. It becomes personality driven because the music itself is so indistinguishable. The only way it can be sold is through these false distinctions, the personalities. I think it’s a trap for audiences and performers alike. I’m not anti anything. I certainly can understand the comfort that people might have in hearing something familiar and the reality is that certain recordings have accompanied people almost their entire lives. The repetition is unhealthy, neurologically. Diversity is healthy. It’s not a political or philosophical stance, it’s just a literal, nutritional reality that variety is good for you. S.Z. : Tell me what got you in the door of the Zomba Prison in Malawi, Africa. I.B. : The signs were positive that they would approve the project, but they would not guarantee it without meeting us in person. We went there and it was all kind of a formality. The commissioner of the prison at the time said that he also wanted me to teach some classes for the prisoners and the guards as a part of being there. I was not only willing to do that, I wanted to. It was a win, win. It led to a deepening of the experience and of the prison and quite literally, it was the key to getting inside the male side of the prison – where the male musicians play is in a separate, privileged area. S.Z. : Your Zomba Prison Project album was nominated for a Grammy in 2016. Tell me how does that happen for an album, mostly sung in the local Chichewa language by inmates in a Malawian prison? I.B. : The world (music) category has become very predictable. It’s democratic, and it’s secret ballot, but it is driven by these big names, most of whom put out a record every year. Between this little pool of people that are stars in the world music category, you pretty much know it’s going to be those names every year. And it was, and Zomba Prison was mixed in with them. S.Z. : I’m assuming if they are in prison, that they have been charged with quite serious crimes. I.B. : Yes and no. (Zomba) is the maximum prison for Malawi. There’re actually 33 prisons (in Malawi) of differing sorts. There are people there that have committed very serious crimes. There are also people there who are awaiting trial or on appeal who may or may not be innocent. That is quite troubling. Given that Malawi is the world’s poorest country, I’m not so sure that their conditions would be radically worse than what you saw in Oregon. S.Z. : Was there anything else unique that struck you during the recording of the album? I.B. : Half of the songs on the record came from the women, who have nothing. They have no instruments, they have no support. And they really were convinced that they were not singers, as far as solo singers, or songwriters and over half of the songs on the record, come from them. The thing that has been so frustrating is that the media has almost completely ignored them. Completely ignored, deleted their contribution to the record. Press that has gone there to visit, has not been gone to the women’s side. Partially because the prison has supported that. They want the band to be the story, but in fact, the band was not nominated, the record was nominated. A record made by 60 people in Zomba Prison, many of whom are no longer there and have been transferred or released, and one of whom tragically died in the prison. She was only 36 years old when we recorded. When people go there and they interview and take photos of these people, it has nothing to do with the record. It’s very troubling, but also revealing to the levels of patrimony and racism that is there. I had a guy send me a picture who said he wanted to do a project with the band. He had two photos taken and he is standing with all of these prisoners, and not one of them had anything to do with the record. S.Z. : The song, “Women Today Take Care of Business,” goes: “While women are in salon doing their hair/their husbands are asleep/While women are in the market selling onions and things/their husbands are sleeping. While men are awake, all they know is to play bawo.” It is great to have a male Malawian singer/songwriter who is commenting on this aspect of his society. It really speaks to global society as well. Let’s face it, women are doing a lot of the work globally. I.B. : Right. I think those are some of the best lyrics on the record. Those were written by one of the non-songwriters who wrote the song specifically for the project with much encouragement. It was one of the last songs we recorded. He was very reluctant to even try to write a song and he wrote the best song, lyrically. Not just because of the politics, I just think his writing is more literate and detailed. He’s also, revealingly, one of the youngest people in the project. He was in his early 20s at the time, so I think he was sitting there in prison. It gives you a lot of time to think about things. He had regret and that was his perspective. Hopefully, for him, he’s going to be released in the next couple of years. Hopefully he will be able to learn that insight and translate it to action when he is released. I think he will.